reduce internal flow of fluids, thus preventing tissue fluid from seeping and edema. 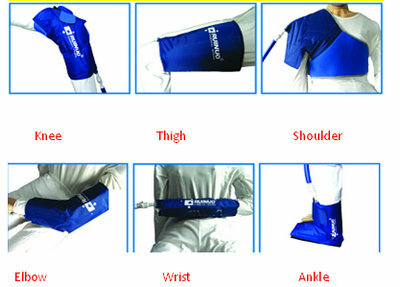 It is mainly used for the cold compression of swelling, hematoma and pain. ① Fix the cold compression wrap to the injured area, first connect one end of the pipe with the ice bucket, then pour ice and water into the bucket, cover the lid, next connect the other end of the pipe with the cold compression wrap through the water shut-off valve. 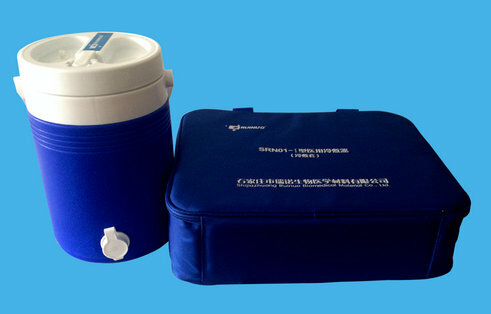 ② Raise the ice bucket above the cold compression wrap, then the cold water will flow into the cold compression wrap automatically and then start cold compression therapy. After the pouring the cold water into the cold compression wrap is finished, turn off the water shut-off valve, then the water shut-off valve will be disconnected with the cold compression wrap automatically. ③ When the cold compression wrap becomes warm, connect the water shut-off valve with the cold compression wrap again, lower the ice bucket below the cold compression wrap, then the water in the cold compression wrap will flow back to the ice bucket, one minute later, raise the ice bucket above the cold compression wrap, repeat Step ② and Step ③.